Anyone who has ever arrived in New York from somewhere else – and stayed to become a New Yorker – can agree on one inexorable truth: there’s no place better to break out of your shell and express your personal style. Manhattan rewards reinvention; in fact, the only consistent ethos here is that you should be a little different. The critical component of the equation is returning to a place each evening where you can comfortably massage in – or shake off – the effects of the day however seems best in the moment: over witty conversation in the kitchen, shared plates with new friends at a welcoming communal table, or a glass of wine you carry up to your own loft-style apartment at our Midtown Manhattan hotel. It would be difficult to stamp New York with your personal style if you didn’t feel as if you belonged here. The Andaz experience begins the moment you arrive through the bronze-colored doors of our Manhattan hotel on 41st Street and are greeted by an Andaz Host. Have a drink in the lounge while checking in via handheld PC, or simply en-route to your luxury Manhattan hotel room. Arrival is at your pace, your style. 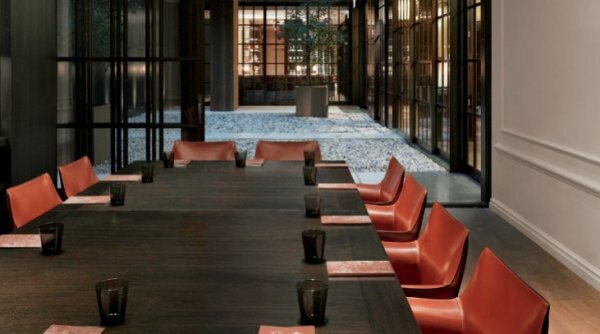 True to the Andaz brand, Andaz 5th Avenue offers uncomplicated and attentive service by real people who are passionate about New York City and their role at one of the most unique hotels in Manhattan. We’re as fervent about New York’s farms as we are our tiny island city-kingdom: Menus in the shop, the bar downstairs and in-room dining are based on our relationships with local farmers and our search for what’s fresh and in-season. Maybe you aren’t from Midtown, but you should feel as if you are. 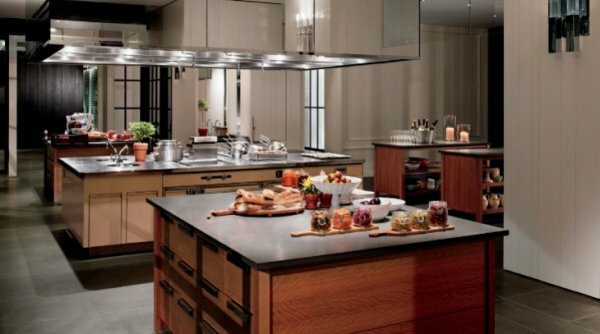 Talk to the chefs at work in the open kitchen of our Manhattan hotel, position yourself virtually anywhere to take in an icon of the city or the quiet courtyard; your Midtown Manhattan hotel experience should be whatever it is that you want to create within a venue that is pure New York sophistication. Welcome to Andaz 5th Avenue. We know that sometimes work is more inspiring when you can seek solitude in the crowd. The Andaz Lounge at Andaz 5th Avenue features a unique communal workspace complete with power outlets and complimentary Wi-Fi; convivial but private at the same time. Our hosts can help you with printing requests or other business needs. The staff is trained to assist and offer guidance to mobility-impaired guests. All areas of the Hotel have been designed and are compliant with ADA rules. The Hotel offers wheelchairs and wheelchair accessible public spaces and guestrooms. Hotel & Guestroom features include; Roll-in showers, Bathtub bench and grab rails, Portable commode, Wheelchair acessible doors (except suites), low peepholes, closet poles, towel racks, sink/vanity. 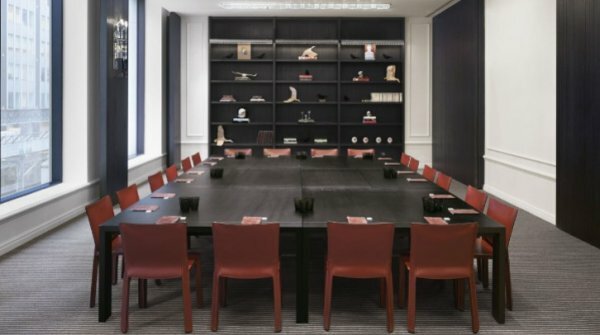 Apartment 2E is our signature New York meeting space for conferences and events. 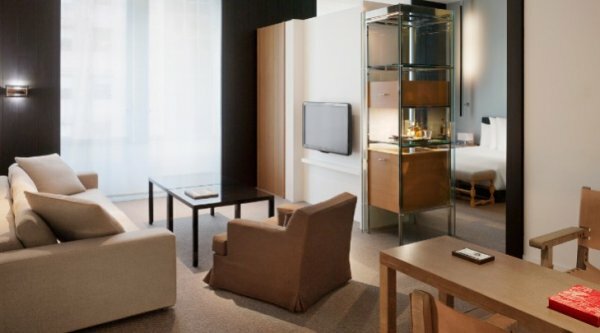 Encompassing all the characteristics of a true Andaz experience, Apartment 2E offers uncomplicated and friendly service. 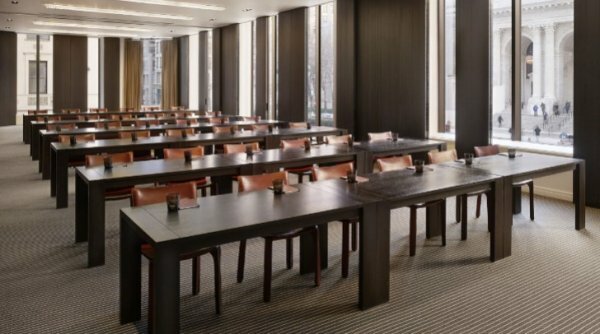 Apartment 2E is a Manhattan conference and event space that is unique to Andaz. 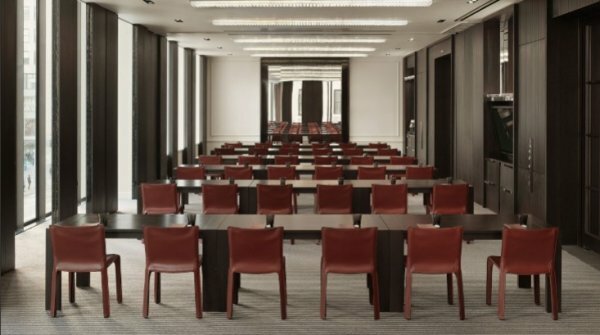 A residential space, Apartment 2E easily transforms into a professional New York meeting space that caters to the creative meetings and events. Celebrate your Manhattan wedding in the privacy of an exclusive residential-style setting at Andaz 5th Avenue hotel. Our Manhattan wedding venues are perfect for intimate gatherings or large-scale events with up to 200 guests. 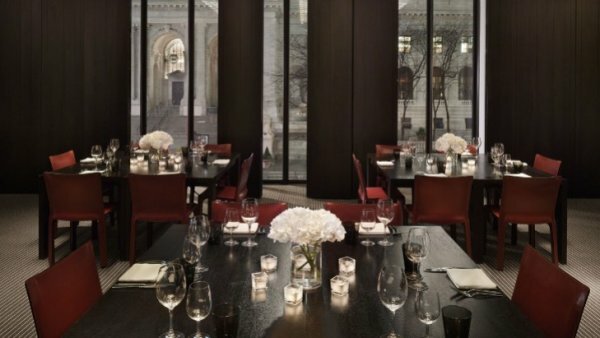 Andaz 5th Avenue hotel also adds a gourmet touch to your wedding in Manhattan. View the extensive catering menu. Our creative chefs will sit down and devise a custom Manhattan wedding menu with you, based on their partnerships with the farmers that bring us the best foods of the season. Use a few of the intimate, stylish spaces within Apartment 2E, or the entire space, spilling into the outdoor courtyard to create the ideal location for your Manhattan wedding. 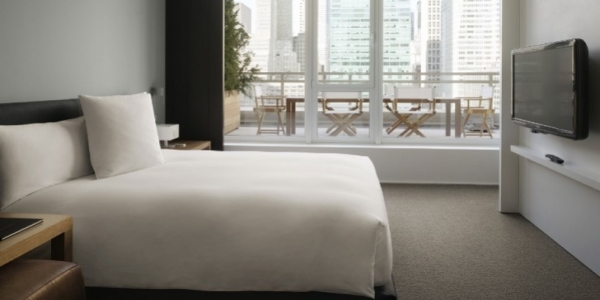 Respire by Hyatt – Hypo-Allergenic Rooms are designed to provide a comfortable New York City lodging environment for all guests, especially allergy sufferers. 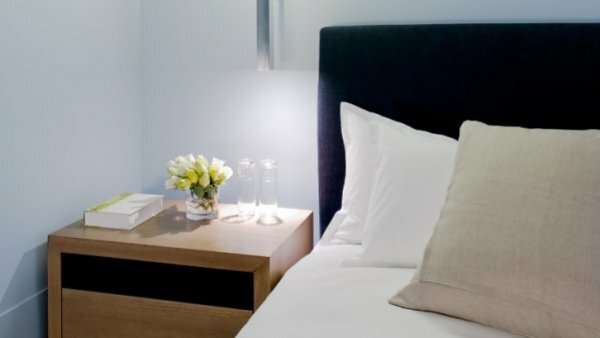 Although all Hyatt rooms follow a strict protocol for cleanliness, Respire by Hyatt rooms undergo an additional six-step process to reduce airborne particles and minimize the presence of potential irritants. This process includes installation of a state-of-the-art air purification system and treatment of all fabrics and surfaces in the guestroom. 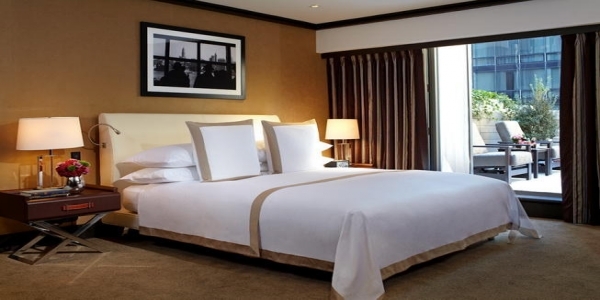 All Respire by Hyatt rooms are installed and maintained on an ongoing basis by PURE Solutions NA. Application of PURE Shield and PURE Clean to minimize presence of allergens on carpet, upholstery and other surfaces in the room. Complete disinfection of Air Handling Unit and Installation of removable tea tree oil cartridge to maintain these conditions. Installation of hypo-allergenic mattress & pillow encasings. Installation of a powerful air purifier by Healthway, listed as a Class II Medical device by the F.D.A. 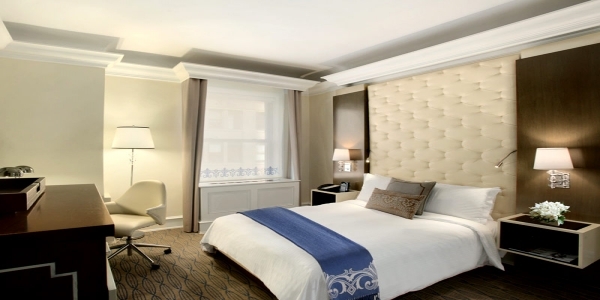 A room perfect for lounging, sleeping and working, this 387 square foot / 36 square meter room at our hotel in the heart of New York City’s Midtown with 12 foot ceilings includes two Twin beds, an oversized two-seat chaise lounge, and large windows overlooking quiet 41st Street. Tony Chi’s serene rooms are inspired by the neighborhood, with closets that recall the rolling racks of the fashion district, and lights evoking pre-war subway lanterns. Oversized bathrooms of travertine marble have walk-in rain showers, double sinks, bath amenities from New York apothecary C.O. Bigelow, and a relaxing foot bath to simulate your own spa environment after an active day in New York City. Non-alcoholic mini-bar beverages and snacks, wireless Internet, local phone calls, and access to the gym are complimentary. 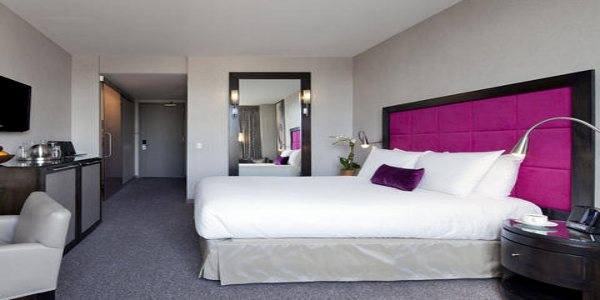 The rooms also feature a Geneva sound system with iPod docking and a 42″ HDTV. 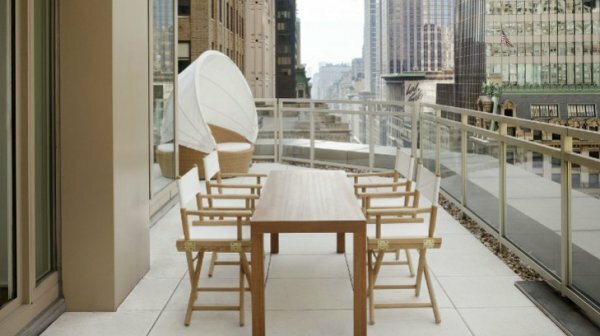 The Andaz King is a 322 square foot/30 square meter sanctuary with 12 foot ceilings and large windows overlooking the landscaped courtyard of our hotel in the heart of New York City’s Midtown.. Renowned designer Tony Chi has created loft-like rooms with oversized bathrooms in travertine marble, with walk-in rain shower, double sinks, and a black porcelain foot bath to relax your peds after an active New York day. Sink into a King platform bed surrounded by plush carpeting. Wash off the day with bath products made by legendary New York apothecary C.O. Bigelow. Non-alcoholic mini-bar beverages and snacks, wireless Internet, local phone calls, and access to the gym at our Midtown New York hotel are complimentary, and entertainment is provided by the Geneva Sound System with iPod docking and a 42” HDTV. For those who like to separate their sleeping and lounge/work areas even more, Tony Chi designed this true, open-plan 366 square foot / 34 square meter loft with 12 foot ceilings and a separate sitting area. Large windows overlook either 41st Street or the hotel’s landscaped courtyard. The oversized travertine marble bathroom has a walk-in rain shower, double sinks and amenities from legendary apothecary C.O. Bigelow, with a black porcelain foot bath. 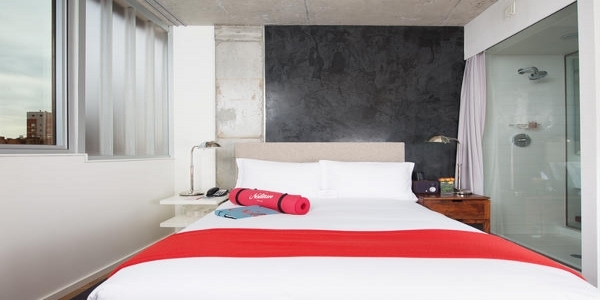 Non-alcoholic mini-bar beverages and snacks, wireless Internet, local phone calls, and access to the gym at our Midtown New York hotel are complimentary, and you’ll also find a Geneva Sound System with iPod dock and 42” HDTV. 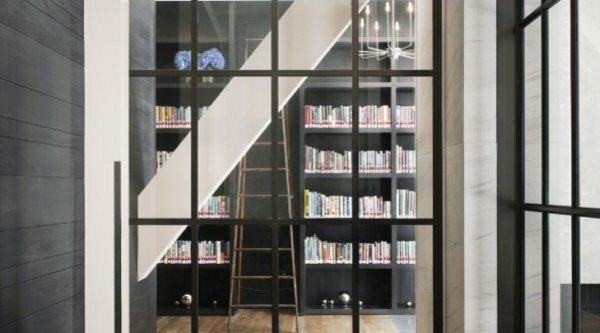 An iconic view marks this 416 square foot / 39 square meter Tony Chi-designed room; the large windows framed by 12 foot ceilings look to the New York Public Library and over the iconic 5th Avenue. A cushy, two-seat chaise lounge is perfect for taking in the view while doing a little work (or not). The oversized travertine marble bathroom has a walk-in rain shower, double sinks and C.O. Bigelow amenities, as well as a relaxing foot bath perfect for overworked peds. Sink into a King platform bed surrounded by plush carpeting. Non-alcoholic mini-bar beverages and snacks, wireless Internet, local phone calls, and access to the gym at our Midtown New York hotel are complimentary, and you’ll also find a Geneva Sound System with iPod dock and 42” HDTV. Extra lounging space and an iconic view of the New York Public Library and 5th Avenue make this 498 square foot / 46 square meter Tony Chi-designed room the ideal haven at our hotel in the heart of New York City’s Midtown.. This room has two Twin beds, with a two-seat chaise lounge next to large windows…and that view. 12 foot ceilings, steel-blue walls, and black poplar shutter doors feel like the ultimate loft apartment. The oversized travertine marble bathroom in our Midtown New York hotel has a walk-in rain shower, double sinks and amenities from legendary apothecary C.O. Bigelow, with a black porcelain foot bath for plunging tired feet. And when it’s time to really relax, the Geneva Sound System with iPod docking and 42” HDTV should help. With extra space for sleeping or lounging/working, Tony Chi designed this true, open-plan 483 square foot / 45 square meter loft in our hotel in the heart of New York City’s Midtown with 12 foot ceilings, separate sitting area, and large windows overlook either 42nd Street or the landscaped courtyard. The oversized travertine marble bathroom has a walk-in rain shower, double sinks and amenities from legendary apothecary C.O. Bigelow, with a black porcelain foot bath. Non-alcoholic mini-bar beverages and snacks, wireless Internet, local phone calls, and access to the gym are complimentary, and you’ll also find a Geneva Sound System with iPod dock and 42” HDTV. Spread out in this 519 square foot / 48 square meter suite. The sitting area includes a sleeper sofa, 12 foot ceilings, and large windows that overlook the landscaped courtyard or the surrounding streets of Midtown. The oversized travertine marble bathroom has a walk-in rain shower, double sinks and amenities from legendary apothecary C.O. Bigelow, with a black porcelain foot bath for party-weary feet. 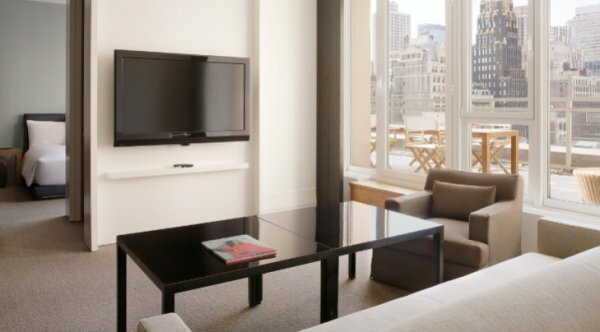 Non-alcoholic mini-bar beverages and snacks, wireless Internet, local phone calls, and access to the gym at our Midtown New York hotel are complimentary, and you’ll also find a Geneva Sound System with iPod dock and 54” LCD, HDTV. Take your pick of views: this 675 square foot / 63 square meter suite at our hotel overlooks either quiet 41st Street or 5th Avenue and the New York Public library. Make yourself at home in the sitting area with 12 foot ceilings, a sleeper sofa and kitchenette. Tony Chi’s serene suites are inspired by the neighborhood, with light fixtures reminiscent of pre-war subway lanterns. Oversized bathrooms of travertine marble have walk-in rain showers, double sinks, bath amenities from New York apothecary C.O. Bigelow, and a relaxing foot bath to simulate your own spa environment after an active day in New York City. Non-alcoholic mini-bar beverages and snacks, wireless Internet, local phone calls, and access to the gym at our Midtown New York hotel are complimentary. The rooms also feature a Geneva Sound System with iPod docking and a 54” HDTV. Few visitors to New York can claim to have viewed the changing lights of the Empire State Building from their suite at our hotel in the heart of New York City’s Midtown. Guests of the 787 square foot / 73 square meter Splash Suite at our Midtown New York City hotel can. The capacious, Tony Chi-designed corner suite has 12 foot ceilings, and looks south to the iconic building and west to 5th Avenue and the New York Public Library. The oversized travertine marble bathroom has a walk-in rain shower, double sinks and amenities from legendary apothecary C.O. Bigelow, with a black porcelain foot bath, in case it’s just your feet that need the splash. Non-alcoholic mini-bar beverages and snacks, wireless Internet, local phone calls, and access to the gym are complimentary, and you’ll also find a Geneva Sound System with iPod dock and 54” HDTV. This 971 square foot / 90 square meter, loft-like suite at our Midtown New York City hotel is truly residential in size. Two bedrooms with 12 foot ceilings flank a sitting area with sleeper sofa, kitchenette and large windows overlooking 41st Street or 5th Avenue and the New York Public Library. Tony Chi’s serene suites are inspired by the neighborhood with light fixtures reminiscent of pre-war subway lanterns. Two oversized travertine marble bathrooms each feature walk-in rain showers, double sinks and relaxing foot baths, and come stocked with amenities from legendary New York apothecary C.O. Bigelow. For those who like outdoor space, suites on floors 12-14 include a balcony. Non-alcoholic mini-bar beverages and snacks, wireless Internet, local phone calls, and access to the gym at our Midtown New York hotel are complimentary. The rooms also feature a Geneva Sound System with iPod docking and a 54” HDTV in the sitting area, and a 42” HDTV in each bedroom. This 1,537 square foot / 142 square meter corner suite comes with two of the most iconic views in New York City, looking south to the Empire State Building and west to the New York Public Library and 5th Avenue. A sitting area with sleeper sofa, kitchenette, 12 foot ceilings, steel-blue walls and black poplar shutter doors lend a serene feel to the large room, whose features – like light fixtures reminiscent of subway lanterns – are inspired by the neighborhood. Two oversized travertine marble bathrooms each feature walk-in rain showers, Double sinks and relaxing foot baths, and come stocked with amenities from legendary New York apothecary C.O. Bigelow. Non-alcoholic mini-bar beverages and snacks, wireless Internet, local phone calls, and access to the gym at our Midtown New York hotel are complimentary. The rooms also feature a Geneva Sound System with iPod docking and a 54” HDTV in the sitting area, and a 42” flat screen TV in each bedroom. An extra-large suite, this 1,779 square foot / 165 square meter Tony Chi-designed two-bedroom corner suite includes a 793 square foot / 73 square meter wrap-around terrace looking south to the Empire State Building and west to the New York Public Library and 5th Avenue. 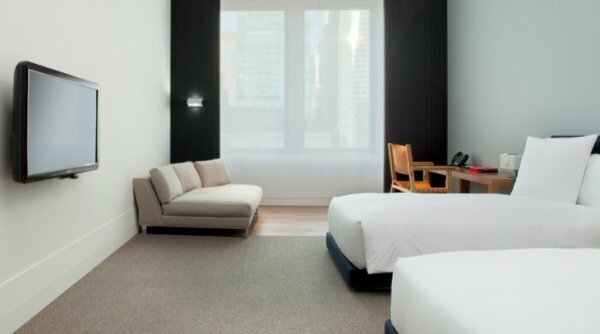 A sitting area with sleeper sofa, kitchenette, 12 foot ceilings, steel-blue walls and black poplar shutter doors lend a serene feel to the large Midtown New York City hotel room, whose features – like light fixtures that evoke subway lanterns – are inspired by the neighborhood. Two oversized travertine marble bathrooms each feature walk-in rain showers, double sinks and relaxing foot baths, and come stocked with amenities from legendary New York apothecary C.O. Bigelow. Non-alcoholic mini-bar beverages and snacks, wireless Internet, local phone calls, and access to the gym at our Midtown New York hotel are complimentary. The rooms also feature a Geneva Sound System with iPod docking and a 54” flat screen TV in the sitting area, and a 42” HDTV in each bedroom. Located on street level of Andaz 5th Avenue hotel at the corner of 5th Avenue and 41st Street, – evoking intimate entertaining spaces of New York’s pre-war apartment residences – is a flexible Midtown Manhattan restaurant where we serve delicious, simple food that changes with the time of year and is dictated only by what’s fresh and at the height of its season. Serving breakfast, lunch and dinner, the shop is a favorite Manhattan restaurant any time of day. Our menus feature dishes made from some of the finest purveyors of fine foods in New York City. But just as we do with our breakfast and dinner menus, we reach further out of the city to the farms and purveyors of New York State for field greens, wild arugula, heirloom tomatoes, chicken and pork that go into homey plates like Chicken Schnitzel and Greek Salad. Like any good lunch restaurant in Manhattan, you’ll find a daily Blue Plate Special on the menu with our spins on tradition using local ingredients (think spaghetti and meatballs with parmesan cheese). Wash it down with fresh house-made lemonade. For dinner, we coax the best flavors from farm fresh ingredients. A little retail section off the dining room of our Manhattan restaurant is a fuss-free space to grab a coffee made with Cafe Grumpy coffee beans, a pastry or a sandwich made from just a few ingredients on hearty artisanal breads. 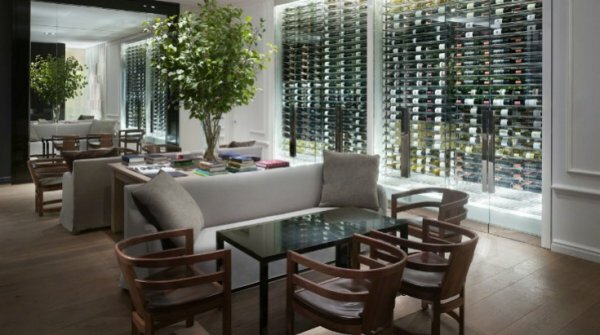 In the evenings, the table transforms into a communal gathering place for a glass of wine at the end of the day. Monday through Friday 7:00a.m. » 5:00p.m. 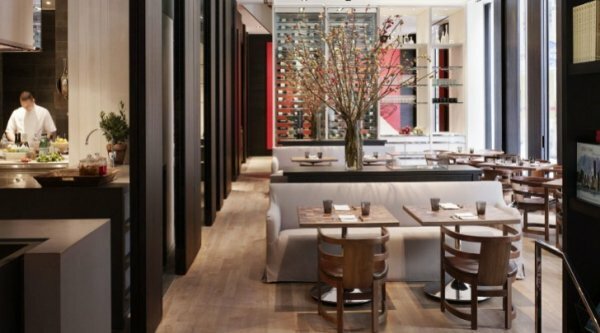 Our retail section of the shop restaurant in Midtown East Manhattan offers a true New York City culinary experience on-the-go! Freshly made soups, sandwiches and pastries are available. Most offerings are made by our talented culinary team, but some of our delicious selections are brought in from Manhattan’s favorite local purveyors such as Cafe Grumpy, and Mast Brothers Chocolates. We also have a New York City-centric gift shop area where you can pick up The New York Times Cookbook or candy from Brooklyn Candy. Our retail section at the shop at Andaz 5th Avenue allows guests and neighbors to take home an iconic piece of New York City and tasty midtown restaurants. 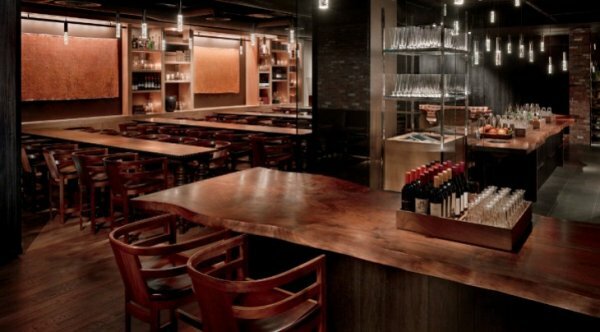 Socialize with friends and colleagues at the bar downstairs – a chic Midtown East bar featuring premium cocktails, fine wines, beer, and a creative menu of shareable Latin-style dishes. 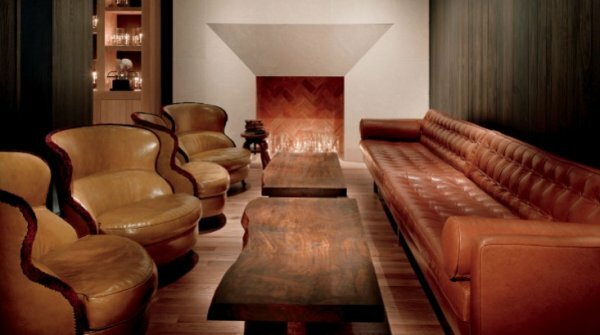 Our Manhattan lounge on the corner of 5th Avenue at Andaz 5th Avenue hotel offers a casually professional setting underground complete with private seating and communal bar tables. Our delicious food and beverage offerings of upscale tapas and platos are equally distinctive. From the Tamworth-Berkshire hogs we buy from upstate producer Meili Farm, for instance, you might find the pork belly morsels with achiote, cumin and citrus or the croquetas with Latin-style chorizo and manchego cheese. Other shareable plates at our Midtown East bar are built around our relationships with folks like Steve Connolly, whose day boat runs out of Massachusetts for menu items like sardines and shrimp a la planca; and the sustainable, all-natural veal, beef, and lamb from Niman Ranch. We choose our Manhattan lounge wines in a similar way – each one for its individuality and value. So you might share your plates with a carafe of Riesling from New York or Pinot Noir from Sonoma. Or a cocktail made from small batch liquor and infused with the same herbs we’re using in the kitchen. 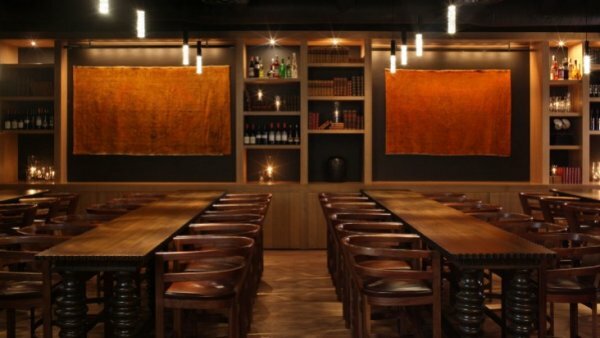 Our convivial Midtown East bar hosts have a genuine interest in every detail here, from the farm that produced the rosemary and oregano used in the brine for the day’s pork chops to the number of ice cubes in our classic whiskey service.